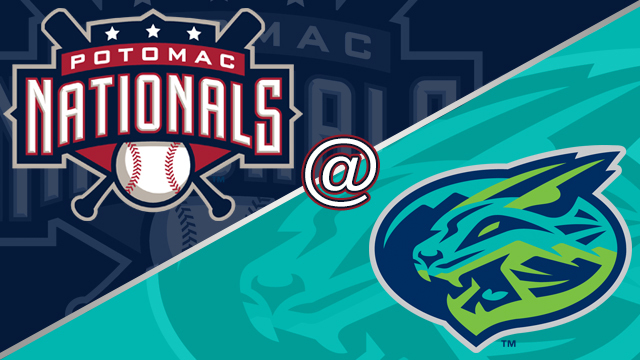 Lynchburg, VA-A big second inning proved to be the difference for the Lynchburg Hillcats (1-0) in the first game of the Northern Division Championship Series, as they defeated the Potomac Nationals (0-1) 5-2. Lynchburg plated five runs in the second inning, while RHP Justin Garza (W, 1-0) allowed just one run and induced three double plays over 5.2 innings for the Hillcats. After a quiet first 1.5 innings in the series opener, the Hillcats sent nine men to the plate in the five-run second inning. Consecutive singles from 1B Anthony Miller and RF Jose Media opened up the inning, while RHP Joan Baez (L, 0-1) then walked CF Austen Wade, who had attempted to drop down a sacrifice bunt. With the bases loaded, Baez got SS Alexis Pantoja to ground out to 1B Aldrem Corredor , who got a force out at the plate for the first out of the inning. 2B Dillon Persinger got the scoring started with a two-run double one batter late, while Baez followed with a wild pitch, which plated Pantoja and gave the Hillcats a 3-0 lead. LF Mitch Longo plated Persinger with an RBI single, and 3B Nolan Jones made it 5-0 with an RBI single of his own. Baez barely made it through the second inning, but tossed five innings and saved the Potomac bullpen. LHP Hayden Howard worked the final three innings out of the Potomac bullpen. Garza gave up a leadoff hit in five of the six innings that he pitched, but three times, induced a double play. DH Bryan Mejia led off the game with a single, but SS Luis Garcia grounded into a double play. C Tres Barrera led off the fourth frame with a base hit, but Corredor grounded into a double play. CF Nick Banks began the fifth inning with a base hit, but Garza induced a double play off the bat of LF Jack Sundberg . Potomac plated a run in the third inning off of Garza and one in the ninth inning off of RHP Dalbert Siri (SV, 1). Banks led off the third inning with a double, and scored two batters later on an RBI single from Mejia. RF Rhett Wiseman reached on a fielder's choice groundout in the ninth, and scored on a two-out RBI double from Banks. In between Garza and Siri, LHP Adam Scott retired six batters and didn't allow a run. Scott set down the first six batters that he faced, from the final out in the sixth through the first two outs in the eighth. Garcia doubled with two outs in the eighth, while Sagdal followed with a single, which forced the Hillcats to go to Siri, who got Barrera to foul out to end the frame. Siri ended the game on a groundout by Sundberg, as Potomac left the potential tying run in the on-deck circle. The P-Nats, who lost the opening game of the NDCS before their last Mills Cup Championship (2014), will turn to LHP Matthew Crownover (5-9, 4.42) on Thursday night in an attempt to level the series. When Crownover last faced Lynchburg, two starts ago, he tossed the first no-hitter in Potomac Nationals history. The left-handed starter hasn't allowed more than two earned runs in any of his last eight outings. For the Hillcats, RHP Jean Carlos Mejia (0-1, 6.00) is set to make just his second career Carolina League start. In his Carolina League debut on 9/1, the right-handed starter allowed four runs on five hits in a loss to the Salem Red Sox. Prior to his call-up, Mejia went 4-8 with a 3.13 ERA in 17 appearances, 15 starts, for Class-A Lake County. First pitch at City Stadium on Thursday is set for 6:30pm. The Potomac broadcast will get underway at 6:15pm with the P-Nats Leadoff Show. You can listen to the Potomac broadcast at potomacnationals.com, at http://bit.ly/P-NatsBroadcast, or on the TuneIn Radio App.